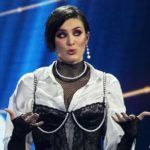 Moments ago, the second semi-final of Ukraine’s national selection, Vidbir 2019, was completed. Out of the eight acts competing in tonight’s semi-final, three qualified for the next round. The host of the show was Serhij Prytula.